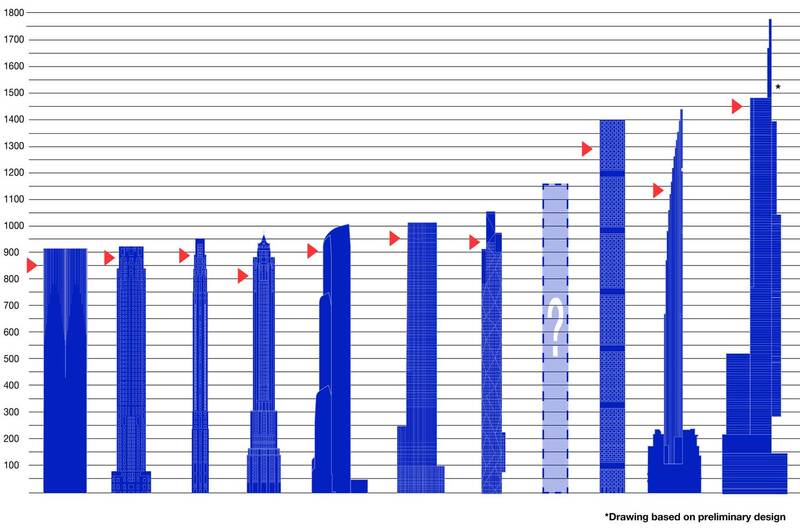 These two charts, created by The Skyscraper Museum, line up buildings with the highest living spaces (and often prices!) in Manhattan’s competitive environment. Looking at past, present, and future residential towers The Skyscraper Museum compiled a list of the tallest residential skyscrapers in New York City. Included in the definition of “residential” are several types of buildings where people live and sleep. Condominiums and cooperative apartment houses are one type. Another, hotels, are generally short-term residences, but historically in New York high-class hotels, such as the the Sherry-Netherland and the Waldorf-Astoria, have offered long-term leases, like apartments. Some buildings are hybrids, mixing hotels and apartments, offices, and retail within one structure. The towers in this “top ten” are color-coded according to their program: blue for residential, purple for hotel, green for office, and red for retail. 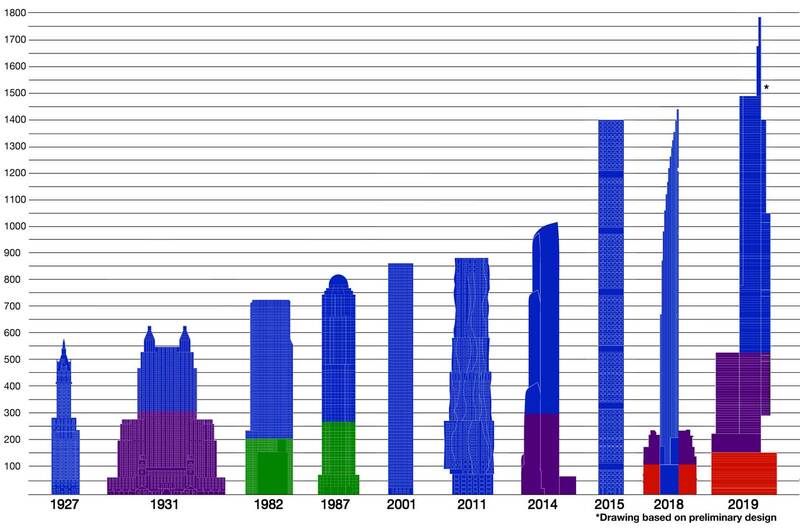 This chart illustrates the consecutive towers that claimed the record for New York’s tallest residential building. As a “top ten” they encompass the 1920s to today and range from the 560 ft. Sherry-Netherland (1927) to the topped-out 1,396 ft. 432 Park Avenue, and the Central Park Tower, projected to be 1,775 ft.
Until 1916, when New York City passed its first zoning law, commercial buildings could pile high as many stories as the owners wished. However, from 1885, housing was regulated by a series of laws that limited height in shifting variations from 70 ft to 150 ft. In 1916, the zoning law again capped the height for residential buildings at 90 ft.. However, it allowed hotels, which were included in the category of commercial structures, to use the same formulas for office buildings. Thus the construction boom of the mid-1920s saw the addition to the skyline of numerous skyscraper apartment hotels. 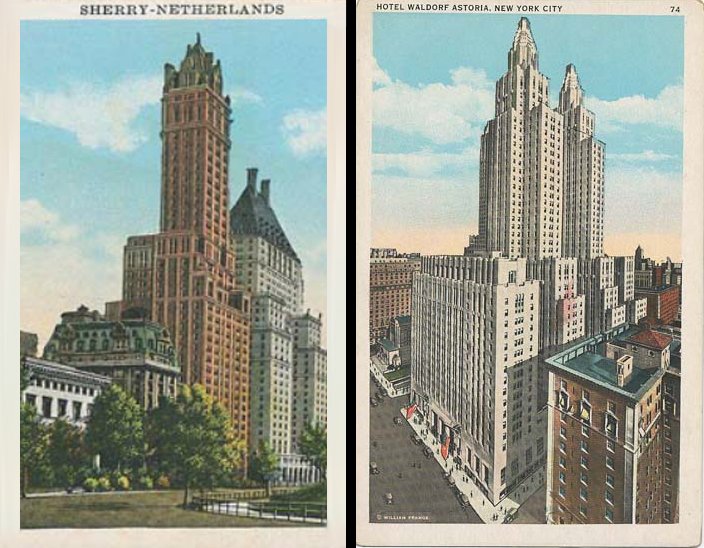 Completed in 1927, the Sherry-Netherland took the title from the Ritz Tower Hotel as the "the tallest apartment building in the world... [with] 125 apartments. "(The New York Times) In 1931, it was surpassed by the enormous, full-block mountain of the Waldorf Astoria, which though built as a traditional hotel, offered long-term residences for wealthy and high-profile residents, including former President Herbert Hoover and the Duke and Duchess of Windsor, in the Waldorf Towers. The Waldorf Astoria remained New York's tallest residential building until the next wave of skyscraper residences began with the rise of the luxury condominium tower. While the history of condominiums in New York can be traced back to the mid-1970s, when the mixed-use buildings such as the Olympic Tower and Galleria were completed, the first significant boom of high-rise condominium development came in the mid-1980s, a period of prosperity in financial markets, as well as a time of significant foreign investment in Manhattan real estate. In contrast to co-ops — the older, favored model of apartment-house development in New York in which there is collective, or "co-operative" ownership of the entire building — condo owners purchase and own their units outright. The first successful models of luxury condominium towers that used slenderness as a strategy for achieving greater height, and thus views, were advanced in the 1980s by three key developers: Harry Macklowe, the Zeckendorf family, and Donald Trump. Clustered around 57th Street and Carnegie Hall, the CitySpire and Macklowe's Metropolitan Tower were both the tallest residential buildings in Manhattan upon their completion. Completed in 2001, Trump World Tower signaled the start of a new “logic of luxury” that was elevated in the 21st century by New York’s latest crop of ulta-slender, ultra-luxury residential towers. Through amassing air rights from surrounding low-rise buildings and developing a slender building profile, Trump set a new precedent for residential high-rises. Ten years later, 8 Spruce Street added another criterion for New York’s most desirable luxury apartment towers: an iconic design from a world-renowned “starchitect.” Standing tall in Lower Manhattan, 8 Spruce Street established its prestige through its Frank Gehry-designed, curvaceous, stainless steel façade, as well as its incredible height; though unlike the other recent residential high-rises on this list, it exclusively offers rental apartments. 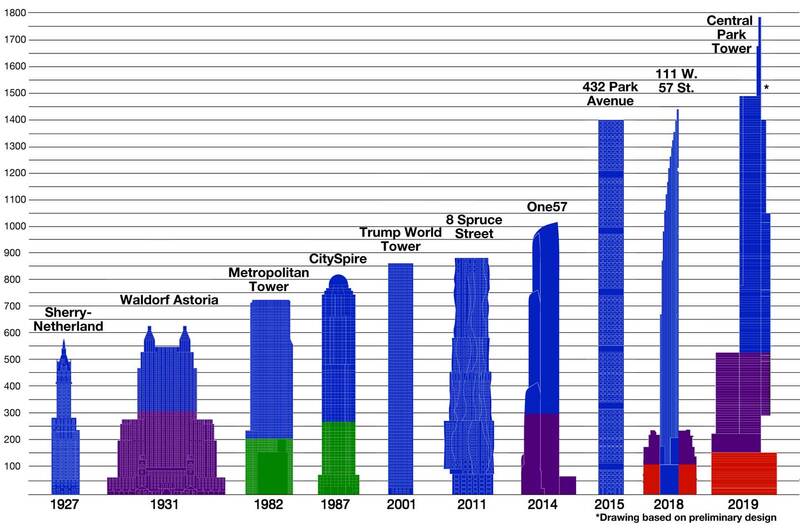 For this chart, The Skyscraper Museum included residential skyscrapers that are completed or under construction as of August 2015, even if they are in the earliest stages of foundation work. Most are to be completed by 2018. 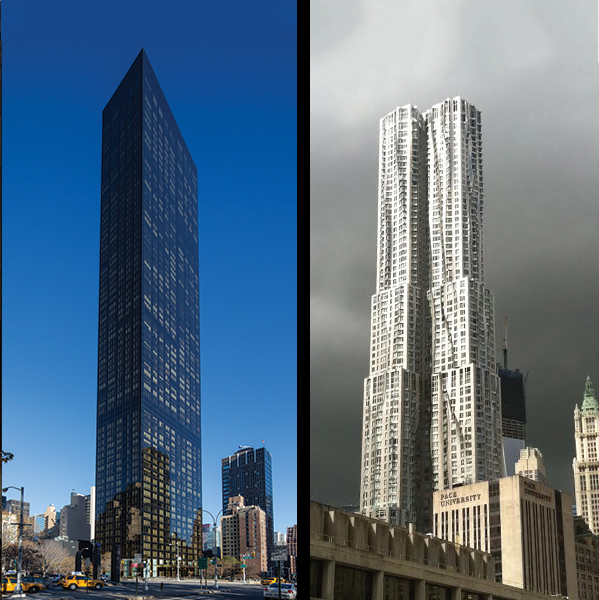 Several other projects that we are confident will reach a height of 1,000 ft. or taller are rumored in the press but lack definitive designs: to represent these buildings, we have placed a “?” to reserve a place in the line up. Click here to view the full list Hover over the image to view the highest occupied floor. The tallest residential towers in New York City, completed by 2018. From Left: 15 Hudson Yards, 30 Park Place, 220 Central Park South, 70 Pine, One57, 35 Hudson Yards, MoMA Tower, 432 Park Avenue, 111 West 57th Street, Central Park Tower. Another way to count building height is by the highest occupied floor, as opposed to the architectural height. You’ll notice that these heights don’t necessarily correspond to the building’s place in the line-up when listed by architectural height. For example, 111 West 57th street is taller than 432 Park Avenue, but its highest occupied floor is about 150 ft. lower. 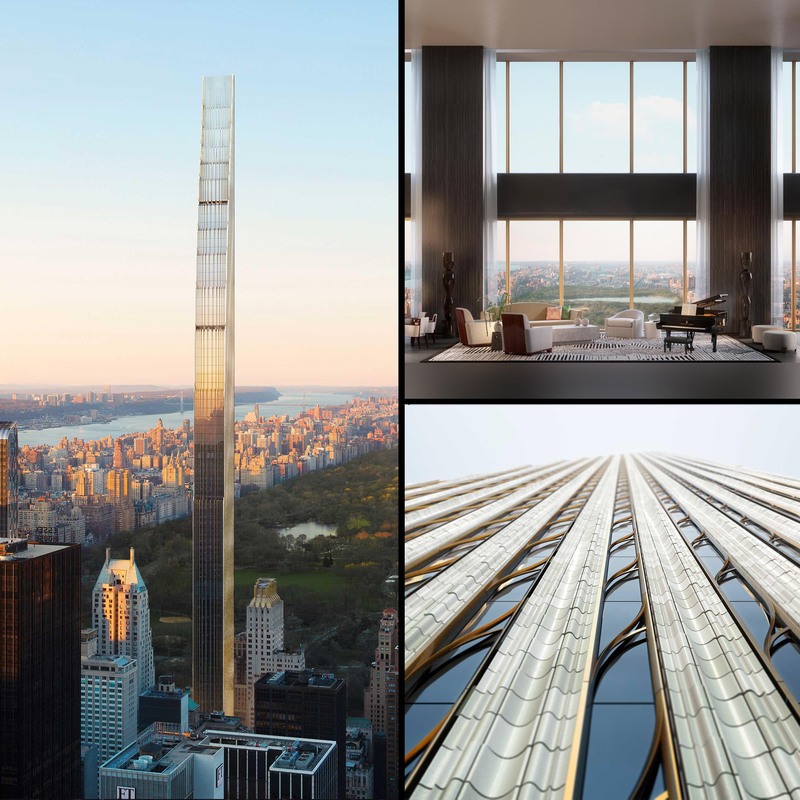 The Central Park Tower, which will be the tallest residential building in the world at 1775 ft. tall, also has the highest occupied floor on this list despite its over-200-foot-tall spire. The towers can also be ranked by their gross floor area (GFA). This reordering reveals the distinction between big and tall buildings and makes clear the strategy of slenderness that many of the tallest residential towers use to achieve their elevated height and valuable views. The most extreme example is 111 W. 57th St., which although the second tallest tower on our list, falls in tenth place in terms of floor area. It uses extraordinary slenderness and full-floor units to create unique properties. Click here to view the list arranged by GFA. Since 2001, the City of New York, the Metropolitan Transportation Authority, and the State of New York have collaborated on a master plan for a 26-acre development site to be built on a platform above the commuter train storage and maintenance yards owned by the MTA-Long Island Rail Road (LIRR). The rail yard is located between West 30th and West 33rd Streets from 10th to 12th Avenues and consists of an eastern portion (Eastern Rail Yard) and western portion (Western Rail Yard), divided by 11th Avenue. 15 Hudson Yards designed by Diller, Scofidio + Renfro, in collaboration with the Rockwell Group, will be the first residential tower built on the site, located in the southwest corner of the Eastern Rail Yard at 30th Street and 11th Avenue across from the High Line. The tower will feature 385 rental apartments and condominiums. Originally known as Tower D and nicknamed “the Corset,” the skyscraper’s design has been modified to a simpler design. The base of 15 Hudson Yards will be conjoined with Culture Shed, a new cultural facility currently in development that combine creative industry with visual and performing arts. 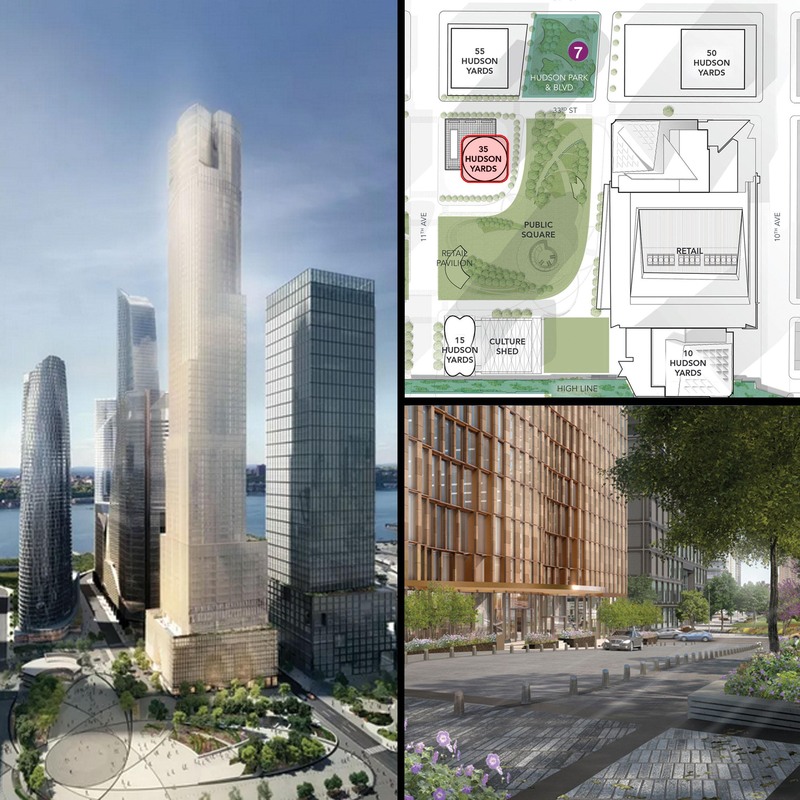 The 937-foot tall, 82-story limestone-clad structure — estimated to be completed in 2016 — is a mixed-use project, with the 185-room The Four Seasons Hotel New York, Downtown on the lower 21 floors. 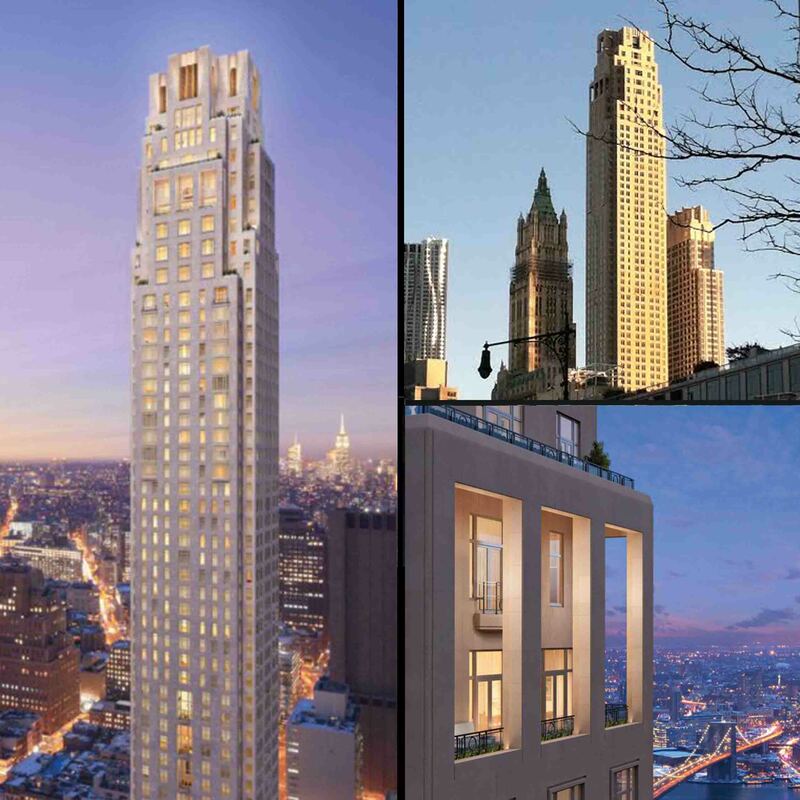 The remainder of the tower, known as the Four Seasons Private Residences New York at 30 Park Place, will comprise 157 luxury condominiums, including full-floor penthouses and setback terraces, with some private residences as large as 6,000 sq. ft.. 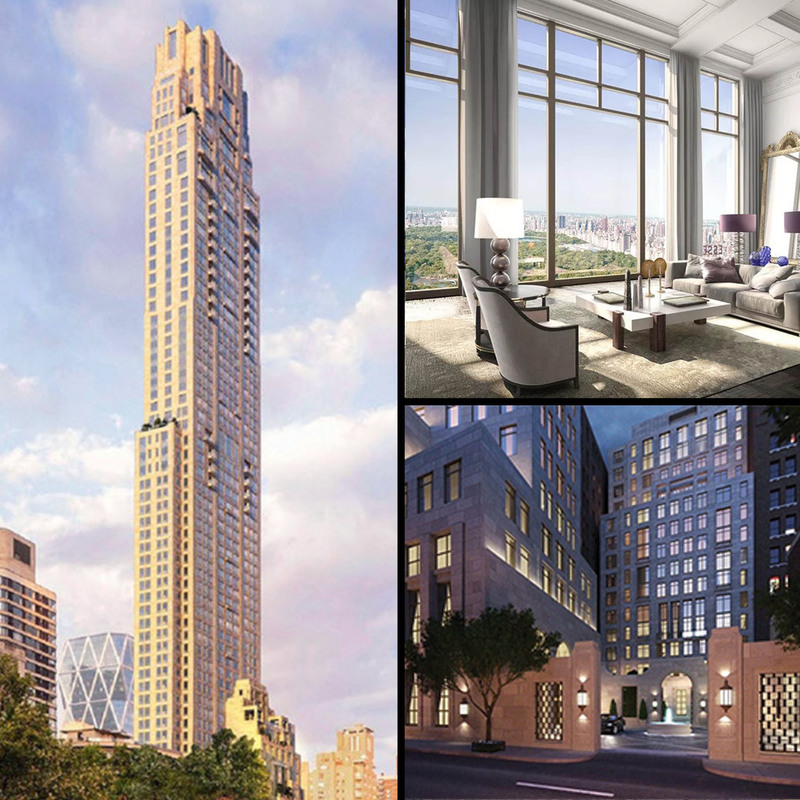 Designed by Robert A.M. Stern Architects, 220 Central Park South will rise 950 ft. and contain 118 luxury residential units when it is completed in 2017. The residences will be split between a 14-story villa and the adjacent 69-story tower. The tower’s design is targeted towards a wealthy clientele, who admire Stern’s other historicist projects, including 15 Central Park West. 220 Central Park South will stand out from the other towers in the 57th street locale, clad in limestone rather than glass and steel. Renderings of the project have not been officially released by the developer or architect. Formerly the Cities Service Building, the 1932-built Art Deco 70 Pine Street has just undergone a conversion from offices to residences. The 952-foot building includes 644 residential units, an extended-stay hotel, and 35,000 sq. ft. of retail space. Developed by Rose Associates and DTH Capital, 70 Pine will be topped with a four-story restaurant and bar. 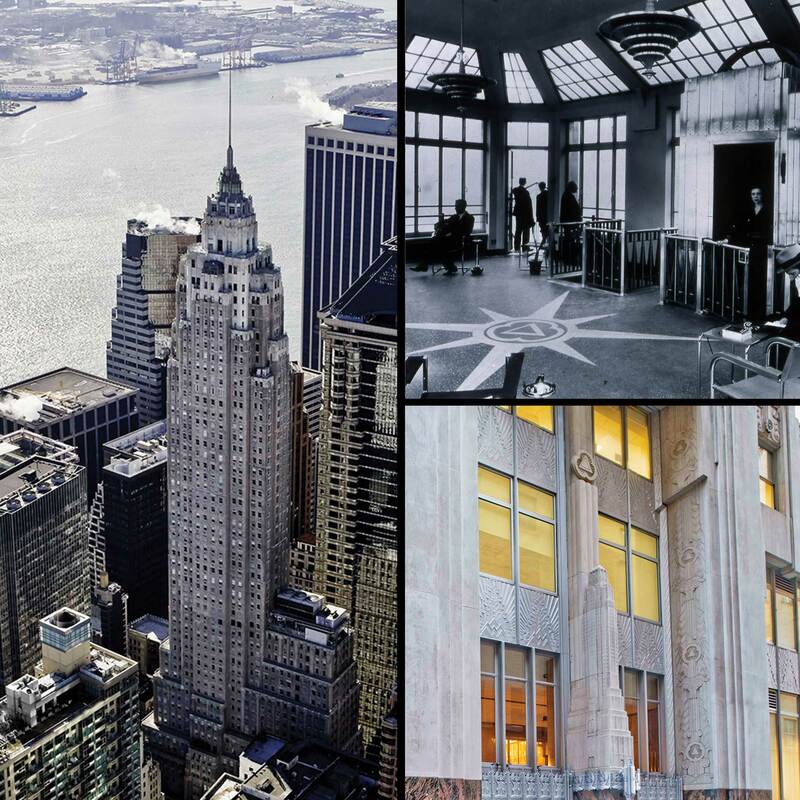 The landmarked skyscraper, which is set to open this fall, is just one of the many office buildings that is being converted to residential as more people are choosing to live in the Financial District. At 1,004 ft. tall, One57 was the tallest residential tower in New York City when it was completed in 2014, only to be overtaken by 432 Park (which will in turn only keep its title until the Central Park Tower is completed). 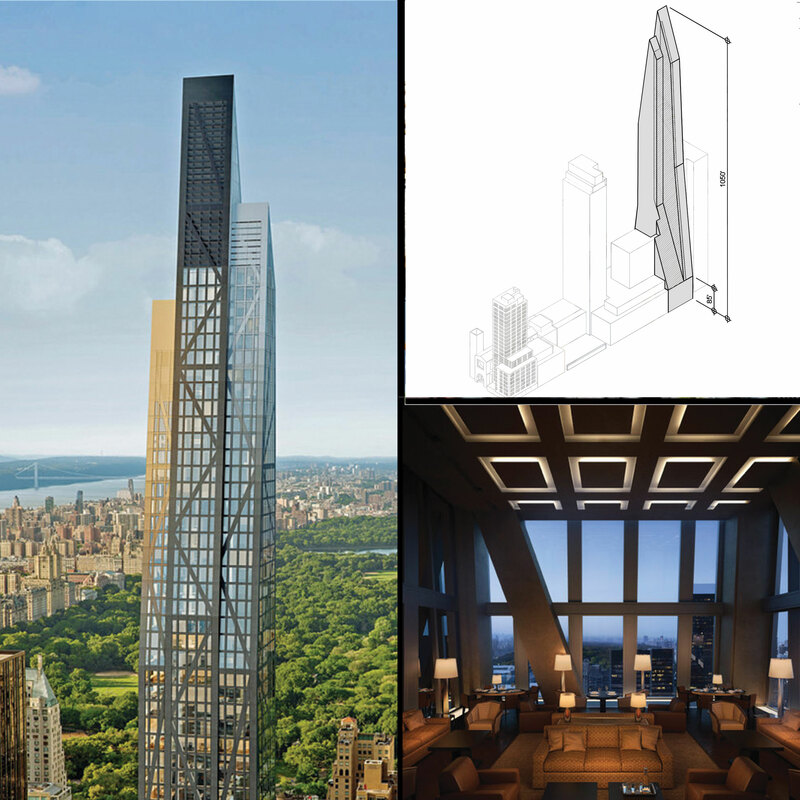 One57 is the breakthrough luxury project of the developer Gary Barnett of Excell. Targeted at an ultra-luxury market, One57 combines the program of a hotel and its services and amenities in the lower section and 94 condominium units in the tower. 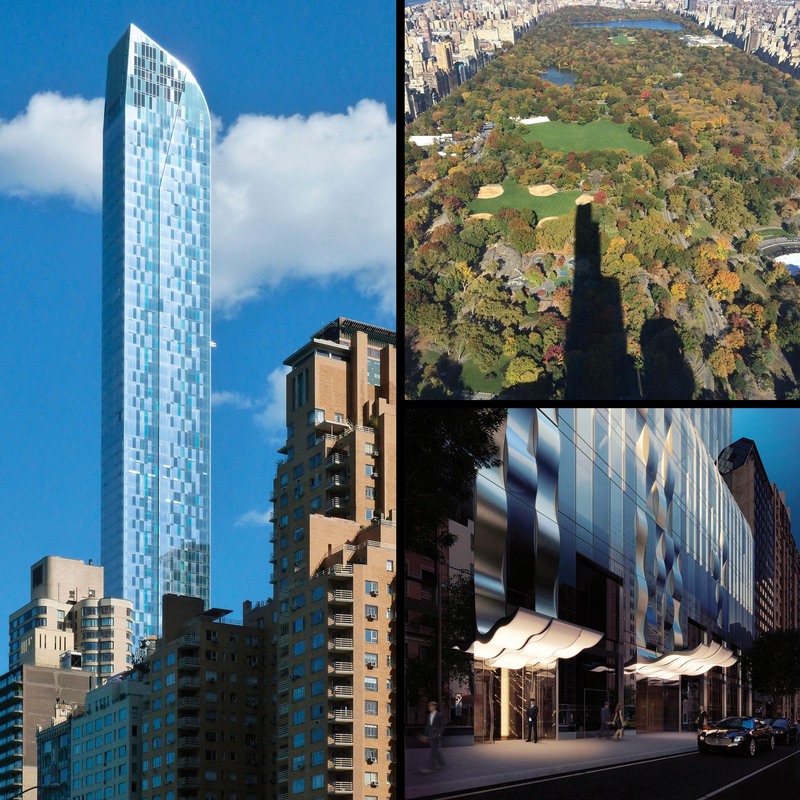 One57 is well-known today for its record-breaking $100 million penthouse sale in January 2015. 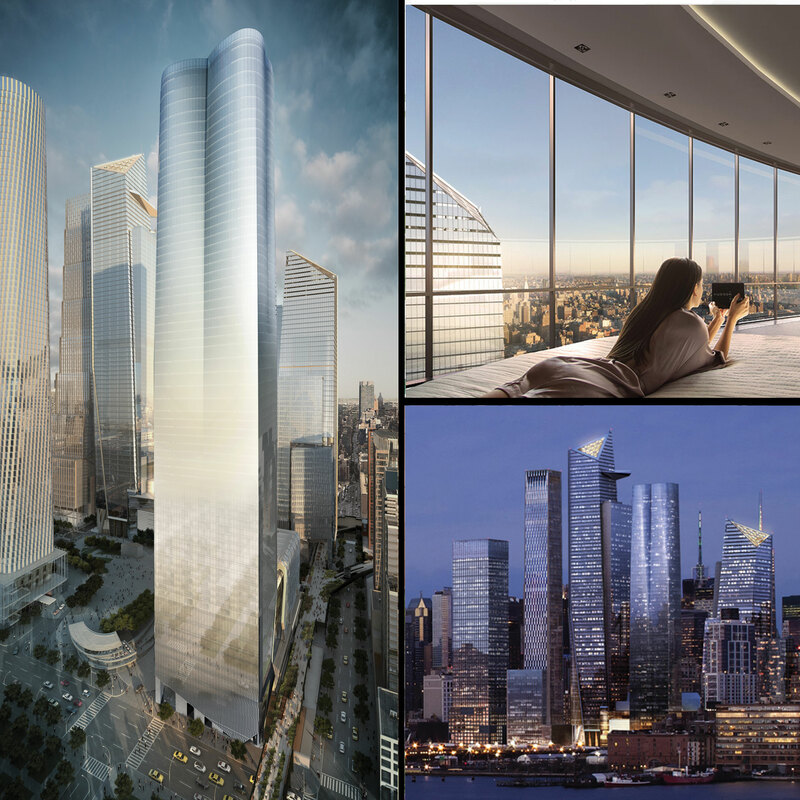 35 Hudson Yards will be the second residential building constructed in the Hudson Yards megaproject and will feature six floors of office space, 217 hotel rooms, and 135 luxury condominiums. At 72 stories and 1,009 ft., the tower, designed by David Childs with SOM, will be one of the tallest residential buildings in the city and the second tallest of the seven Eastern Yard towers. Like 15 Hudson Yards, the skyscraper has seen design changes, beginning as a 900-foot tower with curvilinear setbacks, then transforming to a cylindrical design. The most recent set of renderings show the building as boxier with setbacks and a curvy top. 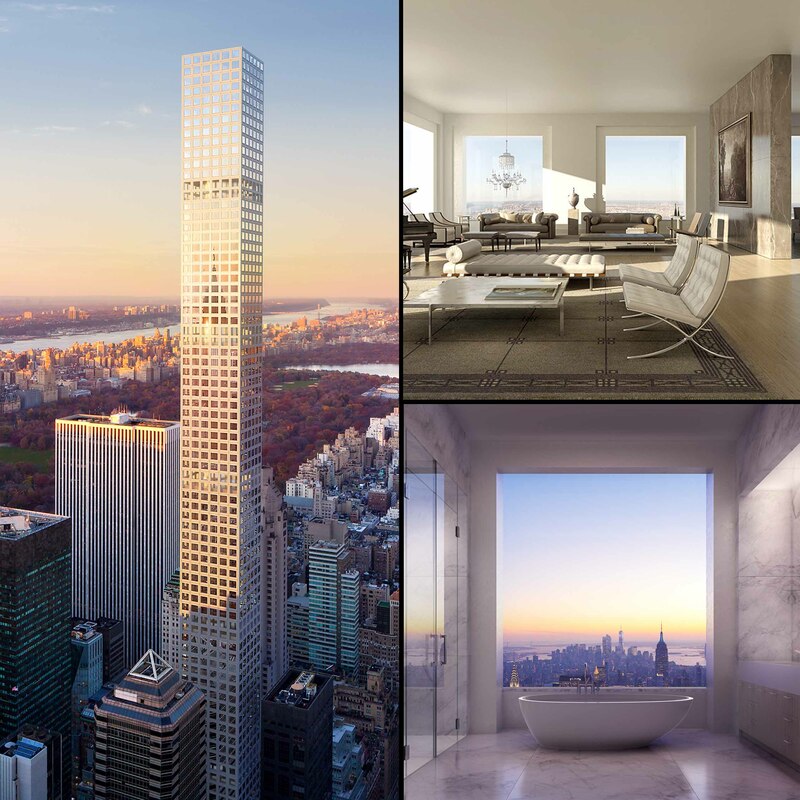 With a flat rooftop that squares off at 1,396 ft., 432 Park Avenue will be — in the words of its developers Macklowe Properties and the CIM Group — the loftiest residence “in the Western Hemisphere” upon its completion in Fall 2015. At that height, it will be taller than the 1,368-foot roof of One World Trade Center and the roof of original WTC Tower 1, which from 1971-1973 was the world's tallest building. 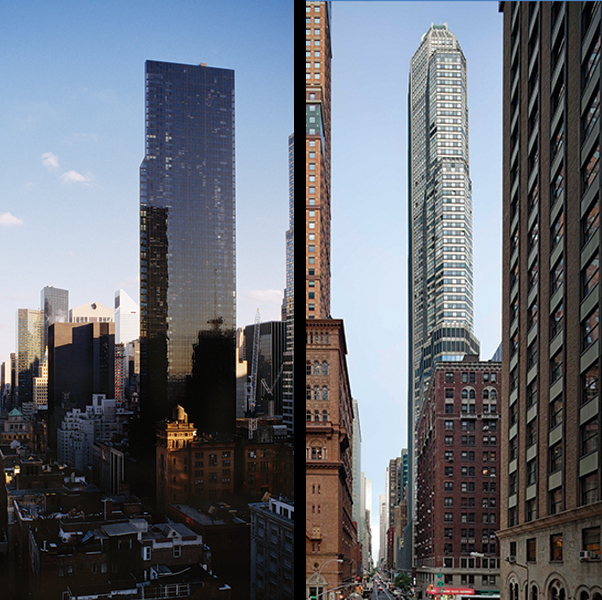 However, two taller residential buildings will beat out 432 Park’s title upon their completion in 2018: 111 W 57th and the Central Park Tower. 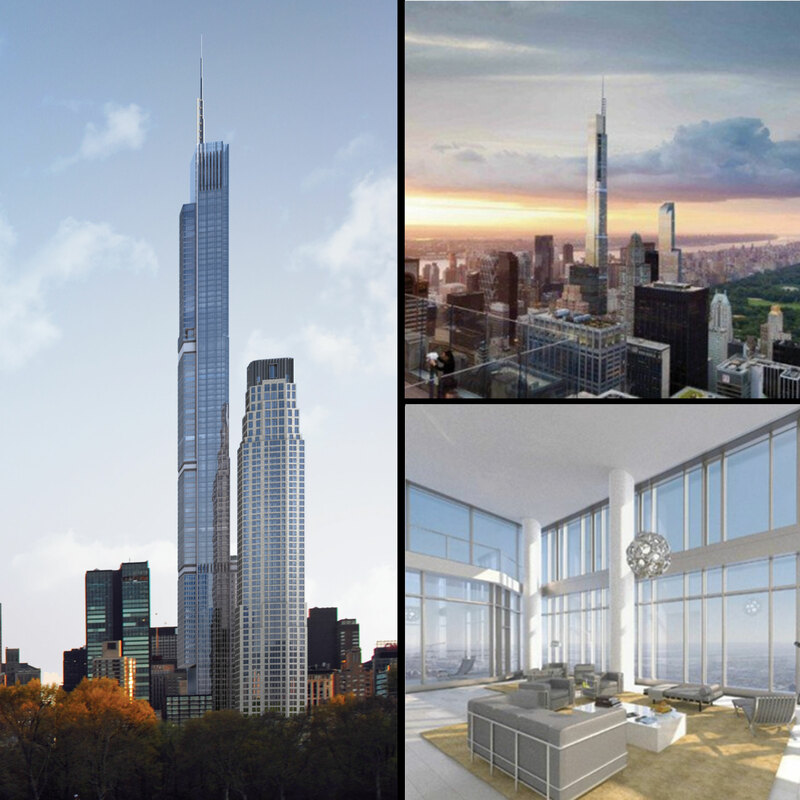 Expected to be completed in 2019, Central Park Tower (previously know as the Nordstrom Tower) will be the tallest residential building in the Western Hemisphere. Designed by Adrian Smith + Gordon Gill Architecture – who, while working for architects Skidmore, Owingss & Merill, designed the world’s current tallest building, the 2,717-foot Burj Khalifa – the Central Park Tower is purported to have the highest roof in the nation at 1,550 ft.. Besides its near-200 residential units, the building will house a hotel and a Nordstrom department store in its base. While construction on the tower has already begun, the developer, Extell, has vigorously denied that any drawings published to date represent the building’s final design.